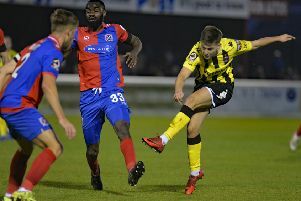 AFC Fylde manager Dave Challinor believes their 6-0 victory against Macclesfield Town was as good as it gets. The Coasters were emphatic winners at Mill Farm as Lewis Montrose, Jack Muldoon, Sam Finley (2), Jonny Smith and Andy Bond all found the net against the league leaders. “It was an outstanding performance with outstanding work rate,” Challinor said. “We had so much intensity to our game with a lot of quality as well. “It’s easy to think you’ve done enough to get through the game because it’s 4-0 at half-time. “We knew we’d get chances because Macclesfield would push players forward and try to get back in the game. “Overall, that performance was as good as we could’ve been. “Even if we had fallen slightly below the first half performance, there was no way they would get back in the game because we were so clinical in the first half. “We knew in the first 15 minutes of the second half would be important. I thought we managed the game well and to get the goal on 60 minutes was very important. “That then gave us the opportunity to put fresh legs on to allow us to keep that momentum going. “We’d asked them to empty the tank, and if the tank was empty after 60 minutes then so be it, but we needed to play with intensity that put them under pressure because they are a good team when you allow them to play. “We were dominant. We don’t have a problem scoring goals - we’re the top scorers in the league - and we know on our day we can punish teams.